The cucumbers in the Demo Garden aren’t doing nearly as well as I might wish, for some reason. At this point, I think there are probably several contributing factors and no real dominant cause. The ‘Homemade Pickles’ cucumber plants in the Family of 4 Garden have really nice looking plants, but they aren’t yet producing very well. We chose that variety because it is supposed to have high disease resistance and high yields. Of course, as I usually tell folks that call into the Garden Hotline, with the vine crops, all you can really do is wait for them to mature to the point that there are both male and female flowers and let nature take its course! Perhaps I’m just being a bit impatient. On the other hand, our community garden plot has yielded about 15 lbs of cucumbers so far this year, in a much smaller space, and that was after the cucumber plants got flattened by hail back just after Memorial Day! We are making our first batch of pickles today. (Or rather, my husband is. He’s making old fashioned lime pickles from his grandma’s recipe.) I’ll try to have a couple pictures later this week. 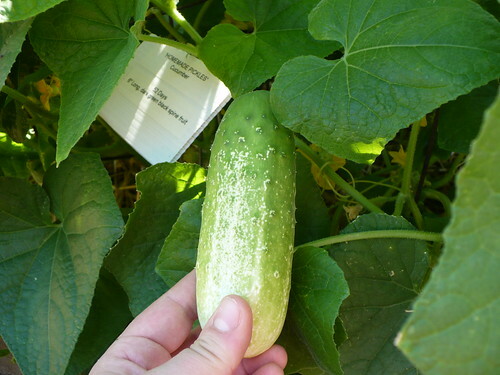 Posted on July 10, 2012, in Around the Garden, Family of 4 Garden and tagged cucumbers, harvest, weather. Bookmark the permalink. 2 Comments. I thought maybe it was just *my* cukes. My Lebanese ones didn’t sprout, so I planted Marketers late. Didn’t sprout either. Stopped watering them, and next thing I know I have vines climbing the trellis. Of both types, I think. But no blossoms for the longest, then all of a sudden now they’re covered with them. No cucumbers yet, but I keep suspectiing I’m going to blink one day soon and find a baseball-bat-sized one lurking (which isn’t all that improbable/bad with the Lebanese). There are just so many weird things going on this year because of the weather. At least we are getting better production from most things this year.